As weapons of the middle ages became more advanced and armor became more common, armies began equipping and fielding soldiers that wore this 15th Century Foot Soldier Half Armour, instead of the once-typical padded and chainmail protections. This armor is made from high quality materials, including steel and leather, and is modeled after the typical armor that would have been worn by the common foot soldier during the later days of the middle Ages. This armor is a far cry from the typical full suits of plate that knights would have favored, although it is not far off when it comes to protection of the more vital areas. The suit consists of a gothic styled breastplate and back plate that are fastened together with leather straps and buckles along the sides and the shoulders, as well as attached an attached series of plates, called a fauld, that wrap around the waist and hips. Attached to the fault are a pair of tasset plates that hang down and provide protection for the upper legs and thighs. 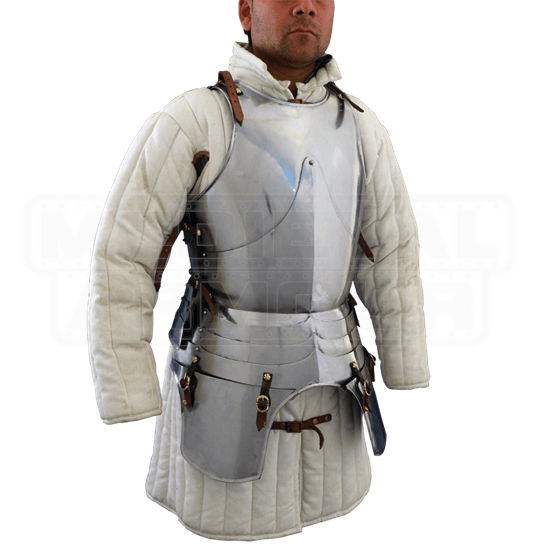 Don this 15th Century Foot Soldier Half Armour with a padded gambeson and a helmet, and you will be ready to march into battle, protected just as the typical soldier was, during those late days of the medieval era.